NCS Technologies packages sophisticated IT infrastructure to support the need of the military and first responders to rapid deployment to the field. The need to be nimble and flexible to respond to military hotspots is obvious. And the current hurricane season also reinforces the need for rapid, flexible response for civilian agencies. The 2017 hurricane season has seen four Category 4 or stronger storms that have impacted the U.S. The Commonwealth of Puerto Rico just received a direct hit from Hurricane Maria that has caused a 100% power outage on the island and colossal damage to infrastructure that will take years to repair. With Deployable VDI, NCS envisioned building a packaged IT infrastructure capability to respond this type of need. A basic configuration includes 1 high quality magnesium alloy Getac X500 Ultra-Rugged Mobile Server platform. 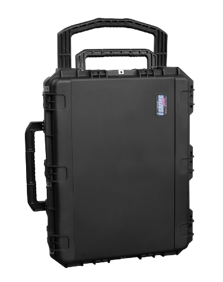 In addition, this configuration includes 7 powerful Getac S410 semi-rugged laptops, developed specifically for first responder and military-type applications. This option provides for centralized control over all client images with reduced downtime and IT support. This solution gives the flexibility to easily and quickly change client images to support multiple applications and specific use case scenarios. The zero client notebooks in this solution contain no data making them far more secure than traditional rich clients. A basic configuration includes 1 high quality magnesium alloy Getac X500 Ultra-Rugged Server platform and 7 Cirrus LT family zero client notebooks. The Deployable Enterprise VDI Workgroup allows for the easy and rapid deployment to temporary facilities where a larger workforce needs to be supported with network services and applications. This makes it easier for organizations to reuse the initial investment repeatedly without leaving equipment behind or undergoing a much more labor intensive process to recover deployed assets. This fully-built configuration for 100 users includes a rugged, rackmount case on casters, and a complete turnkey, hyper-converged VDI solution that is scalable, flexible and cost effective.